1Maynooth University Department of Psychology, Maynooth, Co. Kildare, Ireland. 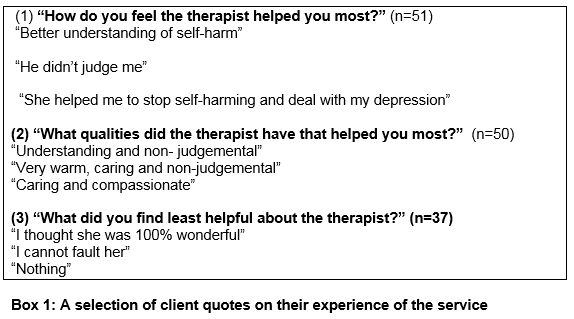 The aim of this study was to investigate the nature and extent of deliberate self-harm (DSH) amongst those attending national crisis centres in Ireland, and to assess clients’ views of the service. A secondary analysis was undertaken of a large data set of clients presenting with DSH (n=823). Clients were predominantly female, under 25 and with self-cutting widely reported (73%). DSH co-occurred with suicidal ideation (SI) (42%) and/or a suicide attempt (SA) (35%). Males were significantly more likely to present with more severe problems, and to use more dramatic methods of DSH; more severe presenting issues were also significantly associated with a history of having friends who engage in DSH. The treatment completion rate was 36%. Clients reported overwhelmingly positive views about the service. This is the first study in Ireland to provide insights into a ‘hidden population’ of people who engage in DSH. A need for greater awareness of DSH and its links to suicidal ideation/behaviour is indicated. Deliberate self-harm (DSH) is a major public health problem impacting on the individual, their family and health services1. It may be defined broadly as an act with a non-fatal outcome in which an individual deliberately initiates behaviour (e.g. self-cutting), with the intention of causing harm to themselves2. Young people, especially females, are most at risk with highest rates reported amongst 11-25 year olds3. Clinically untreated DSH may precede suicide2 and research has identified DSH as the most important risk factor for suicide4. In Ireland, DSH accounted for 12,010 hospital presentations in 20125. This reflects a decrease of almost 2% compared to 2011, although the current rate is almost 10% higher than in 2007. Community rates of DSH are assumed to be many times higher, as most do not seek treatment6, thereby supporting the argument that medically referred DSH represents only the “tip of the iceberg”7. Evidence suggests only 10%-20% of teenagers who engage in DSH, present at hospitals 2,8,9, suggesting, there is a ‘hidden population’ of distressed adolescents7. The current study was conducted in response to the needs of a national suicide and self harm crises service in Ireland called Pieta House. This charitable organisation provides services in 9 locations throughout Ireland. The study objectives were to: (1) investigate the nature and extent of DSH amongst Pieta House clients; and (2) assess clients’ views of the service. The study involved a secondary analysis of a large anonymised data set comprising clients who had used Pieta House services during July 2012 to October 2013 (n=823). The primary presenting issue was DSH; some clients also presented with suicidal ideation (SI) and/or suicide attempts (SA). The data set included 138 variables pertaining to routinely collected service data based on a battery of five proformas/assessment forms called the "Pieta House Suicide Assessment Tool". This draws on items from established standardised scales. Its psychometric status is currently being tested. This study was conducted in accordance with the Psychological Society of Ireland Code of Conduct and was reviewed by a departmental ethics committee. There was no contact with participants. The data set was analysed using SPSS. The sample was predominantly female (72%, n=594) with a mean age of almost 22 years (SD= 9.88, range 7-58). Almost half were under 18, with 20% aged 14 years or younger; 22% were aged 18 to 24 and 14% were aged 25-34 years. Three categories of presenting issues were identified: (1) DSH only (23%); (2) DSH + suicidal ideation (SI) (42%); and (3) DSH + suicide attempt (SA) with/without (+/-) SI (35%). Males were significantly more likely to present with more severe issues (c2 (2, n=821)=21.04, p=0.001,Cramer’s V=0.160). As the clients’ presenting issues increased in severity, the proportion of the sample receiving medical attention from a GP and /or a psychiatrist also increased. A similar pattern was seen in relation to the mental illness variables. Most clients wished to avail of the service. Large proportions of each category (45%, 61% and 72% respectively) had previously attended therapy/counselling services elsewhere (Table 1). The available data indicate that 13% of clients had been diagnosed with a mental illness by a GP, 87% of which involved depression. Large proportions of each category reported having someone available for emotional support (68%-77%). Those with a family history of mental illness were significantly more likely to report more severe presenting issues (c2 (2, n=823)=8.38, p=0.015,Cramer’s V=0.101). Relatively low proportions of ‘active addictions’ were reported across the three categories. However, when clients were asked if they still felt suicidal when not under the influence of alcohol/ drugs, over 14% of the DSH-only category responded in the affirmative. This increased to over 50% in category two (DSH +SI) and to 64% in category three (DSH +SI+SA). Those with more severe presenting issues were statistically more likely to have had a history of friends who also engage(d) in DSH (c2 (2,n=823)=7.67, p=0.022, Cramer’s V=0.97) as well as a history of death by suicide in the family (c2 (2,n=823)=15.28,p=0.000, Cramer’s V=0.136), or amongst friends (c2 (2,n=823)=28.31,p=0.000). The analysis of prompts for DSH (n=588), as reported by the clients, were based on the main prompt given (usually one of several). Sadness was most frequently reported by females, followed by stress; anger and stress were almost equally reported by males (Figure 1). Feeling overwhelmed and concerns around self-image were almost equally reported by both genders. Eight different DSH methods were reported; the available data (n=816) indicated that self-cutting (73%) followed by alcohol abuse (14%,) were the most common methods irrespective of gender. Proportionately more males than females were represented in the other six ‘method’ categories, with males more likely to report more violent methods such as punching and burning. There was a significant association between gender and self-cutting and alcohol (c (1,n=709)=10.75, p=0.001,Cramer’s V=0.129). A total of 254 suicide attempts were reported, 42% of which required hospitalisation. Drug overdose and cutting (bleeding) were the most commonly used methods. More males than females were represented amongst all of the other methods of suicide attempt, especially the more violent methods, such as hanging. Approximately 6% (n=50) reported having had a plan in advance, to die by suicide. Only 36% of the sample completed their allocated therapy sessions. The mean number of sessions offered was 14.99 (SD=2.93) while the mean attendance was 11.72 (SD=5.34). Family members referred over half of the clients (53%) to the service. Other referral methods included: self-referrals (18.5%); school/college (8%); GP (5%); friends (4%); hospital (2%); and ‘other’ methods (9.5%). The response rates to the evaluation form were low (possibly due to the voluntary nature of completion). Most respondents expressed very positive views about the service and especially its therapeutic aspects (Table 2; Box 1). 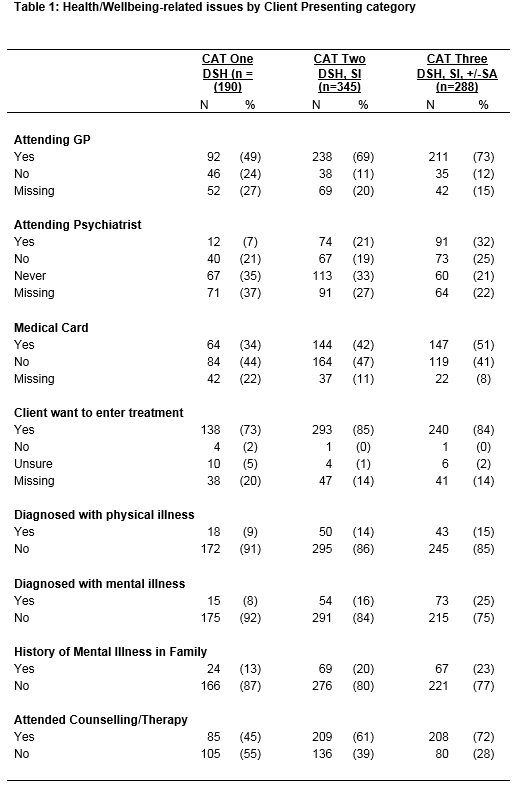 ‘Other’ included mental health services (3%) or other unspecified agencies (6%) and 0.5% missing. This study provides important insights into the prevalence and nature of DSH (and related factors) in Ireland, as well as a useful snapshot of client views on a national crisis service. The findings, although primarily descriptive in nature, are broadly in line with what has been reported elsewhere in terms of the clients being predominantly young (<25years), female and inclined to use self-cutting2,8,10. However, there were some interesting differences in client profiles across the three categories of presenting issues. Adolescent females were more likely to engage in DSH alone, whilst older age groups and proportionately more males, more frequently reported DSH in conjunction with SI and/or SA. 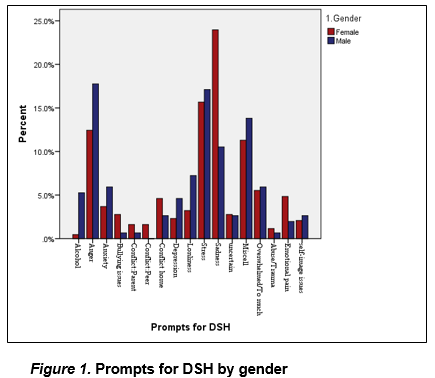 The reasons given for the DSH also showed some interesting gender differences, with more self-reported sadness amongst females and more anger among males. Alcohol misuse is considered an important risk factor for adolescent suicidal behaviours (more so than drug use which is less well characterised)11. In this study, alcohol was the second most common method of DSH (14%) amongst both genders, whilst drug overdose was most commonly used in suicide attempts. A significant minority (20%) of the sample were aged 14 years or under, 10% of whom reported self-harming with alcohol. Figures from elsewhere, based on DSH hospital presentations, show that alcohol was involved in 38% of all cases registered in 2012 5 .In the current study, it is clear that alcohol and to a lesser extent drugs, are only part of the very complex picture of DSH/SI/SA. DSH also tends to be associated with exposure to the DSH of others, including family members and friends11. Our findings show that more than one in five of the clients reported being exposed to DSH amongst both family members and friends and were exposed to suicide in families and friends. These findings suggest a need for a greater awareness of DSH and its links to suicidal ideation/behavior in the general population. Health and social care professionals and others (e.g. schools) should strive to be alert to, and target or intervene more effectively with this group, especially those previously exposed to DSH and/or suicide. Recent Irish research has reported that 1 in 15 young people deliberately harm themselves whilst 1 in 5 experience suicidal ideation;12 furthermore, 5.5% of Irish children aged between 11-13 years experience suicide ideation, most of whom have also engaged in DSH13. Additionally, 21% of the young adults surveyed as part of the My World Survey (MWS) reported having engaged in DSH, with 43% and 7% reporting suicide ideation and suicide attempts respectively14. This research, coupled with findings from the present study, highlights a need to develop, implement and test school and college-based mental health promotion programmes/supports at a national level. Almost 1 in 10 referrals to Pieta House services came from schools and/or colleges. Mental health promotion programmes could both support and inform school, college staff and students about DSH and the associated behaviours and risks. Arguably, psychological support and intervention are also crucial in terms of preventing ‘contagion effects’ following suicide or self-harm incidents in schools, which are become increasingly problematic in view of the widespread use of social media. In Ireland, 507 people lost their lives to suicide in 201215 and, as indicated earlier, DSH is the primary risk factor for suicide4. In this study, more clients presented with suicide ideation and/or suicide attempts than with DSH alone; almost twice as many clients presented with DSH and SI than with DSH alone, with almost one third of the sample having reported suicide attempts. Reassuringly, the client evaluations were overwhelmingly positive and underscore the perceived success of the Pieta House model of care, as well as other aspects of its therapeutic ‘milieu’ that contribute to positive client experiences. However, it is difficult to know how much social desirability bias may have influenced these responses. Notably, substantial proportions of clients had also previously received some form of therapeutic intervention prior to their contact with Pieta House, although approximately one in ten had been formally diagnosed with a mental illness (typically depression). The fact that they were referred to Pieta suggests that the alternative services with which they were in contact, had not been effective, although this requires further investigation. This study was limited in a number of ways. The analysis was primarily descriptive in nature whilst missing data was also problematic. Evaluation response rates were very low possibly due to the voluntary nature of completion. Nevertheless, our findings suggest the treatment/intervention approach used by Pieta House may provide a model of best practice for organisations and service providers who work with people who engage in DSH and/or who experience SI and/or SAs. This model is currently being tested by the service, but perhaps it would be beneficial to explore, in parallel, and using a range of methodologically rigorous methods, not only the effectiveness of the model, but also its implementation and cost-effectiveness on a national basis. This kind of approach would yield important evidence to inform and further enhance practice/service developments both in Ireland and elsewhere. Dr. Paul Surgenor, Director of Reasearch, Training and Education in Pieta House, was in no way involved in the analysis of the data, or influenced the interpretation of the findings. Penny Quinn, Maynooth University, previously worked as a volunteer with Pieta House, but this did not influence the conduct of the study or the analysis/interpretation of the findings. Professor Sinéad McGilloway, Professor in Mental Health Care Research and Well-Being, Maynooth University Department of Psychology, NUI Maynooth, Maynooth, Co.Kildare, Ireland. 1. McMahon E, Corcoran P, Keeley H, Perry I, Arensman E. Adolescents exposed to suicidal behaviour of others: prevalence of self-harm and associated psychological, lifestyle, and life event factors. Suicide and Life-Threatening Behaviour.2013; 43: 634-645. 2. Hawton K, Rodham K, Evan E, Weatherall R. Deliberate self-harm in adolescents: Self report survey in schools in England. British Medical Journal. 2002; 325: 1207-1211. 3. Mental Health Foundation. Truth hurts: report of the national inquiry into self-harm among young people.2002; London, UK: Mental Health Foundation. 4. McAuliffe C, McLeavey B. C, Fitzgerald T, Corcoran P, Carroll B, Arensman E. Group problem-solving skills training for self-harm: randomised controlled trial. British Journal of Psychiatry.2014; 204 : 383-390. 5. National Suicide Research Foundation. (2013). National registry of deliberate self-harm, Ireland: Annual report 2012. Cork, Ireland: National Suicide Research Foundation. 6. Larkin C, Di Blasi, Arensman E. Self-cutting versus intentional overdose: Psychological risk factors. Medical Hypothesis. 2013; 81: 347-354. 7. Ystgaard M, Arensman E, Hawton K, Madge N, van Heeringen K, Hewitt A, Fekete S. Deliberate self-harm in adolescents: comparison between those who receive help following self-harm and those who do not. Journal of Adolescence. 2009; 32: 875-891. 8. Ystgaard M, Reinhold N. P, Husby J, Mehlum L. Deliberate self-harm in adolescents. Tidsskrift for den Norske Laegeforening. 2003; 123: 2241-2245. 9. Pages F, Arvers P, Hassler C, Choquet M. What are the characteristics of adolescent hospitalized suicide attempters? European Child & Adolescent Psychiatry.2004; 13: 151-158. 10. Madge N, Hewitt A, Hawton K, de Wilde E, Corcoran P, Fekete S, Ystgaard M. Deliberate self-harm within an international community sample of young people: comparative findings from the child & adolescent self-harm in Europe (CASE) study. Child Psychology and Psychiatry.2008; 49: 667-677. 11. Hawton K, Saunders K, O’Connor R. Self-harm and suicide in adolescents. Lancet.2012; 379(9834): 2373-2382. 12.Cannon M, Coughlan H, Clarke M, Harley M, Kelleher, I. The Mental Health of Young People in Ireland: A report of the Psychiatric Epidemiology Research across the Lifespan (PERL) Group. Dublin, Ireland: Royal College of Surgeons in Ireland.2013. 13. Coughlan H, Tiedt L, Clarke M, Kelleher I, Tabish J, Molloy C, Cannon M. Prevalence of DSM-IV mental disorders, deliberate self-harm and suicidal ideation in early adolescence: An Irish population-based study. Journal of Adolescence. 2014; 37: 1-9. 14. Dooley B, Fitzgerald A. Methodology on the My World Survey (MWS): a unique window into the world of adolescents in Ireland. Early Intervention in Psychiatry. 2013; 7: 12-22.